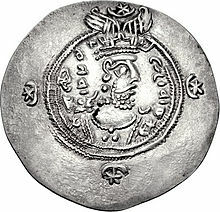 Yazdegerd III or Yazdgerd III (Middle Persie: 𐭩𐭦𐭣𐭪𐭥𐭲𐭩 Yazdākird, meanin "made bi God"; New Persian: یزدگرد), wis the thirty-aicht an last keeng o the Sasanian Empire o Iran frae 632 tae 651. ↑ Department of Ancient Near Eastern Art (October 2003). "The Sasanian Empire (224-651 A.D.)". Heilbrunn Timeline of Art History. New York. This page wis last eeditit on 25 September 2015, at 01:40.